A couple of months after Qureet.com went live, I added this blog to talk about getting the service up and running. In spreading the word about my first couple of posts, I got a nice bump in traffic – mostly from Twitter and Reddit. Some of these visits led to new signups for TweetQureet. Nice! Now, running Qureet.com takes a lot of my time and energy. But I do try to maintain a life outside of work as well. On the day the LifeHacker review went live, I happened to be out and away from the keyboard until late at night. This was probably a blessing in disguise, as a whole flood of new traffic resulted. I’d probably have spent the day obsessing about it if I were watching the dials. Homegrown Analytics, or How I Learned To Stop Worrying About Vanity Metrics and Build Useful Stuff. One of the nice things about my web service is that I’ve built in email notifications. These emails get sent to the site administrator (me!) whenever someone visits my site and engages in some meaningful way. Since I had a steady trickle of traffic and “engagement events” on Qureet.com in the days prior to LifeHacker, I had most of these notifications turned on when I went out on that fateful Sunday. When I got home at 1am and checked my Qureet.com inbox, I found … that’s right … 1000 new emails in my Inbox. Oh joy, oh rapture!!! I thought. Some spammer has added a bunch of Qureet.com urls to their list and I’ve been flooded with spammy requests today. But I dug a little deeper. No, it wasn’t Spam. These were new users. *Real* new users – with legitimate Twitter profiles. Hundreds of them! Over the course of the next hour, I deduced that something had happened “out there in cyberspace”. I eventually tracked it down to the LifeHacker review. One of the not-so-delightful side-effects of this flood of new traffic was that my Gmail quota for the day got used up by 4.35pm. So, alas, a bunch of TweetQureet emails to existing users that were supposed to go out that day … well … they didn’t. Doh! Using Gmail as my SMTP service seemed like a good idea initially. I had no idea I’d be hitting up against their daily limit so fast. When I realised what was happening, I just turned off most of my notification emails. Within a few hours, the Gmail throttle relented. Emails started going out again. Phew! This solved the problem. Important emails started getting sent again (ie emails to new and existing users). Thank Goodness! In this case, let’s home in on the first bullet: browser-visits to the homepage. When someone visits my site, I try to make sure there’s a link to the signup page, regardless of which page they land on. This includes each and every blog post. Patrick Mackenzie (aka patio11 on the internets) has written eloquently that the first link on your webpage will get exponentially more traffic than any link appearing further down the page. So, I put a link to my homepage at the top of each blog post, and then I put a “Sign In With Twitter” button at the bottom. If a reader hangs around and has more than a passing interest in the TweetQureet service, they might want to sign up. Here’s the breakdown of traffic and how well it converted on the day and the day after the article went live. Note that these are not unique pageviews, so some will be repeat visits, though my analytics suggest that the proportion of repeat visits is low. So, what was the overall conversion rate of my signup funnel that day? 36.9%. That’s pretty decent, and speaks well of the quality of traffic which came from the LifeHacker review. More than a third of people who visited my website after reading the review converted to users. Usually I can only dream of conversion stats like that. Ahhhh. Along with those 388 new signups to my TweetQureet service, I’ve noticed a significant spike in engagement with the service in the following days – including from existing users. This makes sense: my website is being shared around and discussed online. I’ve also had a steady (though gradually-decreasing) stream of new users flowing in the days and weeks since the LifeHacker review went live. 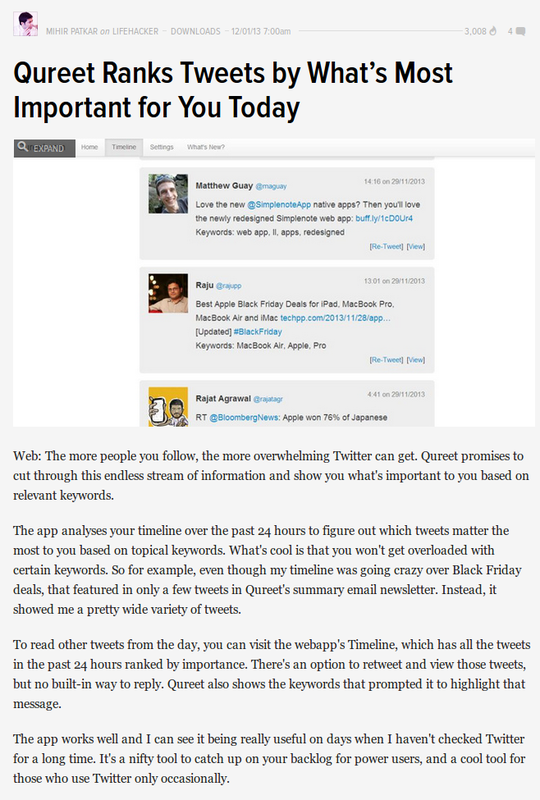 Interestingly, Qureet was also featured on several Spanish-language websites in the aftermath of the LifeHacker review. So, a significant proportion of my user-base is Spanish-speaking. No es un problema: TweetQureet will filter tweets in 16 languages as of the time of writing. The plan is to add new languages as and when they are needed. “Why isn’t there an Unsubscribe Button?” (Answer: “I’m working on it!”) This was the most common suggestion, and there is indeed now an Unsubscribe checkbox on your Account page. Phew! “Can you pull my Twitter Favorites to help improve your recommendations?” (Answer: “Yes!”) I’ve now added support for using favorites to learn more about peoples’ interests. I’m rolling out Favorites to my user-base gradually. If you want yours turned on now, drop me an email! Overall, I was really pleased with the results from this review. It got me a huge raft of new users. It was also an excellent stress-test for my Golang webserver and filtering backend, all of which – at the time – was running on a Raspberry Pi. Awesome!